A high-powered New York City banker must attempt to hide his demented alter-ego from friends and associates as he begins to lose his mind. 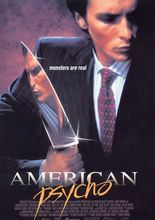 Patrick Bateman, a well-to-do Manhattan investment banker enjoying a lifestyle fueled by America's warm embrace of capitalism and deregulation in the late 1980s, balances his "above-board" existence as a skilled worker and schmoozer with a secretive double life as a serial killer, eventually losing his ability to keep the two separate as his hatred for his "legitimate" associates slowly takes hold over his psyche. Adapted from the controversial yet well-respected Bret Easton Ellis novel of the same name, American Psycho divided critics and audiences upon its release, though it has grown into a cult favorite in the years since.